The selective type of criteria put forth by the NPS for the Archground expansion was too narrow in scope. Had thIs process taken place in the days of the original competition, Saarinen and Kiley would have been prevented from entering because their firms at that time would not have been large enough. Out of limited criteria come limited results. The NPS stated publicly that the opinions of Saarinen colleagues were irrelevant since their works happened over fifty years ago. Nevertheless, I have gathered over thirty supportive letters from these collaborators, and their voices about modern additions to Saarinen and Kiley’s original work on the Arch and its grounds are still insightful for thinking and feeling persons to consider. These letters appear together with ones which support the inclusion of Cahokia, a World Heritage site, in the East St. Louis riverfront discussion, even though the NPS considered Cahokia at less than eight miles distance too far away. SAARINEN’S DESIGN INCLINATION FOR E. ST. LOUIS. Susan Saarinen, landscape architect and daughter of Eero Saarinen, the designer of the Gateway Arch, emailed me the following reflections she had concerning her father's grand vision: "Here's what the arch grounds looked like when City Fathers conceived of the Jefferson National Expansion Memorial Competition. Vision doesn't come easy! It required courage and vision to commit to making an old site by the side of the river into a memorial worthy of Jefferson's Louisiana Purchase and the forward thinking for our nation. My father, Eero Saarinen, understood this and he understood the importance of connecting the Arch Grounds to the Courthouse and East St. Louis. He was passionate about designing to the larger context. It took 14 years to raise the money, figure out the construction details and start construction. What do you suppose Eero Saarinen would suggest today to support reparations for the Arch itself and economic needs of the City of St. Louis? Something small? I don't think so. I think he would suggest, again, that the other side of the river is, and always has been an important part of the project and an important part of the future. I am joining Eero's colleagues and the Eco Arch Foundation to advance this idea and begin serious discussions as to how to make this happen." Here is the response I sent her when she asked if I knew anyone who remembers what Eero had in mind for the east side. I will allow her father and his colleagues to answer. Allen J. Dehar, FAIA, NCARB, quotes Eero Saarinen as saying on August 19, 1961: "The other side of the river- East St. Louis-must be brought into the whole composition. We must make this a great green park." Ralph Rapson, FAIA, wrote in 1992, "I am writing this letter of endorsement in support of Saunders Schultz's exciting proposal for the East St. Louis waterfront. The design is not only a functional space to house cultural activities, but an exciting and visionary symbol signifying the unity of the two cities embracing the Mississippi river. The proposal with its great expanse of green park would provide a magnificent backdrop and continuation of Eero Saarinen's powerful arch. The bridge designed and landscaped by architect, Ted Wofford, and sculptor, Sandy Schultz, ties the Old Courthouse site into the national Park in a way that I believe would be welcomed by Eero Saarinen and Dan Kiley for its elegant simplicity and logical and harmonious extension of their design concept. I feel that Eero Saarinen would strongly approve of this creative complement to his masterpiece. I gladly pledge my support to nurturing this idea to maturity." Robert Burley, FAIA, Eero Saarinen's designer-in-charge for the JNEM and the Arch. "Your Eco Arch idea has genuine merit. It creates a visual link to the eastern river bank, without attempting to compete with the Memorial itself. The act of gently tilting an on-axis green space towards the Arch strengthens that link and enhances the view of the Memorial. East St. Louis is really front and center for one of the great urban spectacles in the United States- only the seats have been missing! How would Eero and Dan react? No one can say for certain, but it is my opinion that they would react very favorably to your sculptural-landscape concepts." George Matsumoto, FAIA, "It was nice to speak to you the other day. The Eco Arch is quite an impressive undertaking. It certainly has the potential to tie the communities of St. Louis and East St. Louis together. It seems to fit well with Eero Saarinen's vision and would enhance the arch and transform the region." 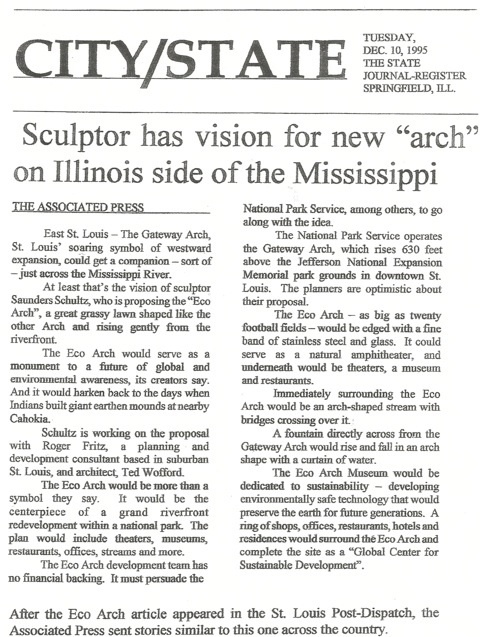 Philip Henderson,FAIA, "Saunders, here is my endorsement for the Eco Arch: The Eco Arch completes Eero's vision for the Jefferson Expansion Memorial: Arrival point from the East-Crossing the Mississippi-Passing through the Gateway Arch-Passing by the Courthouse, home of Government by the People, to open the West." Anthony R. Moody. AIA, " I strongly endorse the Eco Arch project, a brilliant and daring design to complete that grand and visionary idea conceived by Saarinen and Kiley. It ties both sides of the river together and unites Saarinen's Arch with reborn East Saint Louis, in a sublime "Echo" of new and old. It reminds me of Baron Georges Haussmann's plan for Paris in pure strength and scope. And as the saying goes, "Make no small plans". The Eco Arch meets that challenge with a project for the ages. May the fates allow another much needed and excellent project to reach fruition. Best wishes for the success of your history-in-the-making project. It will certainly catapult you and the area across the Mighty Mississippi into the category of iconic." Allen J. Dehar, FAIA, NCARB, "As a Saarinen alumnus and a member of the design team that brought the gateway Arch to reality, I support your alternative design for a larger park site than the competition proposes for the East St. Louis site. I also endorse a park site that would reinforce the axis of the Arch and the Old Courthouse, so elegantly strengthened by your landscaped pedestrian bridge. The proposed Eco Arch design would provide a conceptual bridge westerly across the river to the monumental park base beneath the Arch, all in keeping with Eero's expressed desire." Before he died recently, Allen called to express how much our friendship meant to him and, along with Ralph and many others, thanked me for working so diligently all these years to help save Saarinen's legacy as well as the heart of our region. Bruce R. Detmers, "I was involved with the Arch project for eight years prior to and after the death of Eero Saarinen. I believe that Eero would have been enthusiastic about your proposed development of the site opposite the Jefferson Memorial and would have wanted the development in East St. Louis to be on axis with the Arch and Old Courthouse." John Buenz, Chairman, Solomon Cordwell Buenz, Chicago. "Out of respect for Eero and his magnificent St. Louis Gateway Arch, I am honored to be asked to join the Saarinen alumni team you are assembling. I am would be pleased to help bring your Eco Arch concept to reality by extending Eero's broad-spectrum approach to combining architecture-with-environment. The Eco Arch concept, symmetrically located directly across the Mississippi river from the Gateway Arch and Park, definitely respects Ero's planning/design philosophy as does the landscaped bridge leading east from the old court house. I believe your Eco Arch City Center Park could transform East St. Louis as did Prospect Park in Brooklyn, N. Y. Eero would be most gratified. There are not that many Saarinen colleagues left. It is almost impossible to get over twenty architects, or any professionals, to agree on anything, yet most have agreed that the Eco Arch would have Saarinen's approval." Joseph F. Savin, "As a Saarinen colleague who worked with the master on the JFK terminal, I can say that your Eco Arch resonates with the Gateway Arch. Time has proven how strong a symbol the Arch is. Its expressive power and popularity put it on a par with a French cathedral. And your Eco Arch has such a fresh approach to complimenting the Saarinen classic by freeing the earth and raising it up instead of covering it over, a celebration of nature." Robert L. Ziegelman, FAIA, "As the only Saarinen alumnus creating a documentary on Eero Saarinen, I have spoken to many of the twenty-plus architects you have contacted. It is extraordinary to read that we all agree on so many points. I am honored to join them in stating that I agree that Eero and Dan Kiley would approve of your Eco Arch development as well as your pedestrian bridge linking the Arch and the Old Courthouse. It is also my belief that the National Park Service's competition is designed whereby Eero and Dan could not have participated as an entrant." Norbert Blum, Eero Saarinen Associate, 1960-67, "Neither could the Saarinen proposal have been selected, designed or built without a hopeful expectation that someday the National Park Service could find a more appropriate distant location on the monument's east-west axis in East St. Louis. Your Eco Arch proposal and your simple landscaped bridge do nothing to diminish or detract from Eero Saarinen's monumental achievement and everything to complete and enhance its commemorative intentions. They are exactly the solution Eero Saarinen and Dan Kiley would have recommended or designed had the competition requirements been a little less severe." Norman Perttula, FAIA, "It is of key importance that any proposed developments must be harmonious and sensitive to that which exists, any adverse effects can not be tolerated. I am pleased to join the ranks of my former colleagues who had the pleasure and honor to work at the Eero Saarinen and associates office in Michigan, and who are in support of your design proposal for the Eco Arch concept. I feel that the Eco Arch plan direction is respectful of the original established design principles, and would receive the approval of both Eero Saarinen and Dan Kiley." Jack Goldman, "I cannot overemphasize the concern that many of us have for maintaining the strength of the simplification of the East St. Louis Eco Arch proposal. If allowed free reign to the East St. Louis designs, the NPS competition can only prove to be a major detriment to the quality and beauty of Eero's arch and site. Besides the Eco Arch, I believe that Eero Saarinen and Dan Kiley would also approve of the Lid Bridge connecting the Arch and the Old Courthouse." Balthazar Korab, Saarinen architect and photographer. "It is my pleasure to join with my old Saarinen friends endorsing your Eco Arch and bridge projects. Your Eco Arch site would become an elegant destination place for all visitors, who would then proceed through the "Arch" and on to the great western National Parks. I believe that Eero Saarinen and Dan Kiley would consider your solution appropriate." Fredrick T. Kubitz, AIA NCARB. " I feel a bond with my fellow colleagues who along with me, worked in the "cultural oasis" known as Eero Saarinen & Associates. Under the direction of Eero Saarinen these men and woman experienced first-hand the creative process that went into making each and every architectural project unique. Saunders Schultz was one of these individuals who observed that process and understood how it led ultimately to the creation of the catenary curve that was to become the Jefferson National Monument. After viewing the plans for your Eco Arch development, I believe this concept is a viable solution that would enhance the importance of this great monument for both the surrounding communities and the nation as at large"
John Kinsella, “Wouldn’t it be wonderful if your vision results in a destination place and civic focus for East St. Louis neighborhoods that are struggling to become places but lack any larger identity and focus. 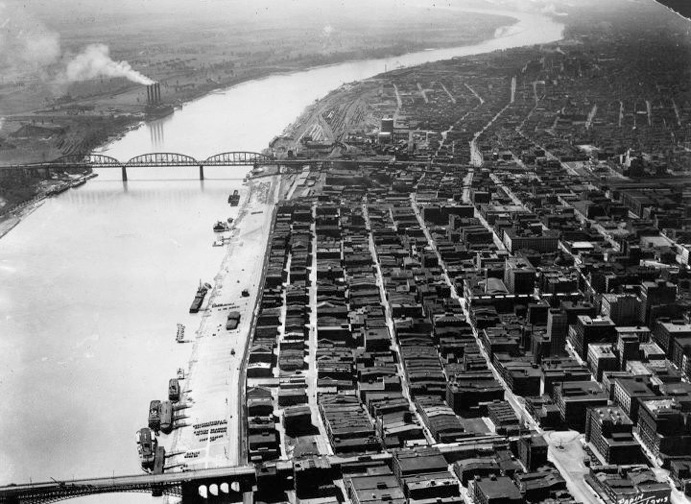 And what if the raised interstates that ring the site were to become portals from this left bank riverfront to a vast network of reforested interstate-edged linear parks that radiate out to reconnect those neighborhoods to each other and to the river. Leonard S. Parker, FAIA, AIAMN, Gold Medalist, "Your design for the Eco Arch on the opposite side of the Mississippi from Eero Saarinen's St. Louis Arch is a fitting complement to the Jefferson National Expansion Memorial. Your recommendations for reconnecting the arch grounds back into downtown St. Louis would benefit both. The extent of the Eco Arch site as you have designed it appears to relate across the river in a better fashion than the site proposed by the National Park Service site. I believe that the inclusion of additional property towards the Eads Bridge to the north as envisioned in the Eco Arch proposal would enhance development on the east side of the river and allow better views from and a better relationship with the Jefferson Arch and Arch grounds." Andrew Nasser, Architectural Engineer, Civic and Structural Engineer, California and Nevada, I was part of Eero Saarinen's architectural staff at his Bloomfield Hills office in 1956-57. I witnessed part of the period when Eero's creativity produced his structurally emblematic projects: MIT Chapel, TWA Terminal, Yale Hockey Arena, and Dulles International Terminal. The St Louis Arch is his most monumental structure, which has become a significant national treasure. I feel strongly that the east bank design proposal by Saunders Schultz for his Eco Arch is the only, appropriate and integrated design that complements Saarinen's Arch. 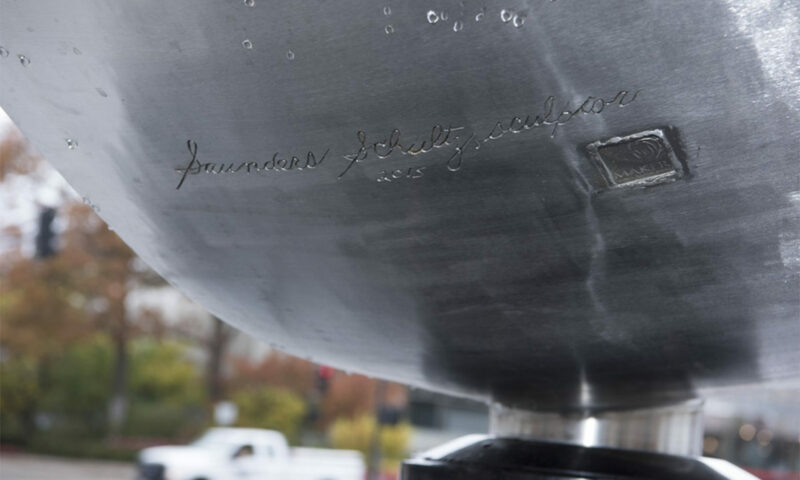 It is fortunate that a nationally known sculptor such as Schultz, who worked with Saarinen, has devoted many years to considerations of alternatives. Such is the process that produces a unique artistic response like Schultz's Eco Arch. It would be a missed opportunity not to give this design the highest consideration. Harold Tsuchiya, "As a Saarinen Alumnus (1950-1955), I support the alternative design concept of your Eco Arch on axis with Eero's Monument and the extension of the grass Plaza on the west by the bridge and the Courthouse. I join with other Saarinen friends in endorsing your Eco Arch and bridge projects". Richard W. Quinn, FAIA, As a former apprentice at the Saarinen firm from 1994 to1996 and a personal friend of Allen Dehar, FAIA, I enthusiastically endorse your concept of the Eco Arch. I believe it would be a very dramatic enhancement of Saarinen's design and complete his "dream"
Edward Saad, " I was fortunate to have worked for Eero Saarinen for over ten years. No doubt, Eero's Arch is among the world's most cherished monuments and must not be diminished by mediocre developments around its site. I believe your Eco Arch concept across the river and Lid bridge tie from the Arch to the Old Courthouse are compatible and respectful of the Arch, thus worthy of serious consideration." Niels Diffrient, "The Gateway Arch has become even greater and more appreciated with the passage of time. I'm aware that you appreciate its importance in your proposals for the East St. Louis waterfront and your landscaped pedestrian bridge linking the Arch to the Old Courthouse, and your work is directed to respecting and enhancing the quality of Saarinen's vision. Other designs that do not appear to sustain this important relationship should not be considered, even if they are more expedient. This is not a good enough reason to compromise a national treasure." Roger T. Johnson, "I am in agreement that the East St. Louis site should be on the Arch/Courthouse axis as proposed. I am also in agreement that an architectural competition would not be my first choice when members of the original team are still active and so well informed. Because all of those involved are in their 80's, I believe the most suitable arrangement would be a consortium of the original participants, your office and others who might be active when the proposed project were executed in a few years down the road. I believe your emphasis on a single strong architectural statement on both sides of the river is very appropriate. The simpler the better so as not to detract from the Saarinen Kiley team solution." Gunner Birkerts, "I admire your 26 year effort to protect the East St. Louis Riverfront Development. The proposed Competition program should include your 100 acre site requirement. If respected, it would allow to maintain the needed symmetry to the design concept for the East bank. Also, I hope the National Park Service competition teams will benefit from your design thoughts." Thomas Bosworth, FAIA, Eero Saarinen & Associates Alumnus, 1960-1964. Emeritus Professor of Architecture, University of Washington. "I support the concept of the Eco Arch proposal. Good luck!" Antonio Roman architecture studio. Bilbao, Espana “In 1997 I had the opportunity to visit East St. Louis as a part of field-work for my doctoral dissertation. The east side of the river offered the main panoramic view of the monument in which the arch is -in the architect’s own words-“a proper visual center and focus for the park”: though scarcely urbanized, the East St. Louis site seems to form a part of the park and arch ensemble across the Mississippi River. In my view, site and extension convey, especially given your international recognition as a sculptor and your background as an associate of Eero Saarinen, both artistic intuition and a very valuable exercise in cultural promotion: not only for St. Louis and the United States, but also for contemporary architecture, since the endeavor would contribute towards preserving the work of the architect and his collaborators as a living legacy. Gene Festa, "The fact that Eero's design was completed in it's completed form is a synergistic miracle. The present delineation of the competition site for future development opens the possibility for an unfortunate outcome. The open question may be whether another miracle is in the air." Harold Roth, FAIA, "As a native St. Louisan and former member of Eero’s staff in Michigan, I’m delighted with the continuous interest in developing improvements to the environment surrounding the Arch. And that includes land immediately across the river in East St. Louis. I commend you for your tireless efforts over the years on behalf of the National Park site and its surrounds. The Arch is one of this country’s major landmarks while serving as the recognizable symbol of the gateway to the West. With best regards,"
Lewis F. Zurlo, AIA, NCARB, Saarinen Alumnus 1959-1961: "The idea of The Eco Arch to mirror, The Gateway Arch, across the river on the east side in the form of a park, reinforcing the axis of The Gateway Arch and the Old Courthouse and bringing significant economic improvement to the east side of the river would seem to me an idea in concurrence with Eero’s way of thinking architecturally. I believe he would also approve the integration of the idea into the greater community. Tilting up of the Eco Arch on an axis in the form of a green park will strengthen the visual relationship between The Gateway Arch and the Old Courthouse. It would also give a new perspective from the east side of the river toward The Arch. All ideas worth pursuing. Cesar Pelli, FAIA, "What you propose is an interesting and ambitious design. It would create a fantastic viewing platform for Eero's arch." W. Kent Cooper, FAIA, “As a Saarinen associate architect when the Arch was coming into existence, I was at the time Eero's "man in Washington”, helping to guide design and construction at Dulles Airport. After Eero's death, with Dulles complete and my own office underway, I turned my attention to the National Mall, leading the team to bring the Vietnam Veterans’ Memorial into being. A few years later, I was offered the opportunity to develop the design for the Korean Veterans’ Memorial, reshaping the western end of the National Mall, and creating a symmetry, which was called for from the very beginning. 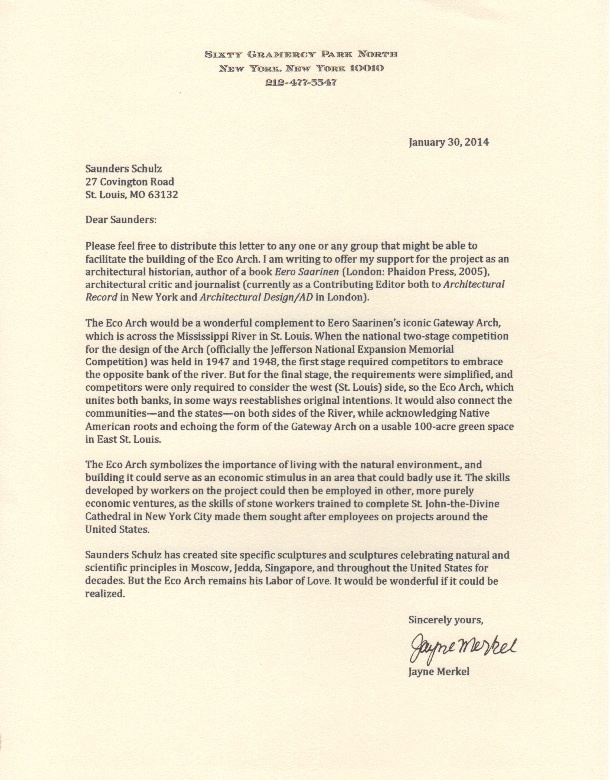 Charles Harris, Chairman, emeritus, Harvard Graduate School of Design and Landscape Architecture “Thanks for sharing this very supportive letter which puts your vision for the Eco Arch in a similar historical context as the National Capital Mall. This letter and the many others endorsing and supporting the ECO ARCH has to become part of a nationwide effort to achieve the goal that you and so many of us have been wanting to see done. Susan, now you see that you are not alone in your concern for your father's legacy and the realization of his grand vision. To see my connection to the Arch's designer, please visit saundersschultz.com, Schultz-Saarinen Connection. "Your timeless vision for the Eco Arch could change the trajectory of East St. Louis." "Buckminster Fuller told me, East St. Louis will never thrive until we make peace with the thousands of dead Native Americans buried from East St. Louis to Cahokia. Your Eco Arch honors these woman and men in a monumental visionary manner." "Your powerful design will relate well to the nearby mounds of Cahokia and history of the area's first Native American dwellers. This river once was forced to symbolize a bounty of exile with the Indian Removal Act, but your project brings Indian presence back across the river to the Eastern shore and redeems a regrettable chapter in American history." Dr. Earl Lazerson, President, Southern Illinois University. "My first priority is the expansion of the national park to the East St. Louis shoreline... Your concept has a large uplifting vision carrying your eye over a great green expanse to the hills beyond East St. Louis. Your symbol captures the historic theme of "Mound City" and its connection to Cahokia." H.C. Millford, St. Louis County Supervisor and Director of Economic Development. "I see the Eco Arch project being integrated into the regeneration of East St. Louis. It ties the two cities together aesthetically and culturally, relates to Cahokia Mounds and brings a sense of history. No other proposal comes close"
Charles Schweighauser, Author, Environmental Studies Professor, University of Illinois, Springfield. "This project could single-handedly inspire a city to turn itself around. Metro East can take its place among the great urban environments of this country and draw its share of the world-wide tourists who now travel to the Gateway Arch and Cahokia Mounds." "It is my pleasure to join with my old Saarinen friends endorsing your Eco Arch and bridge projects. I also feel that it complements beautifully the Saarinen monument and extends the concept east of the Mississippi tying it in with all of the southern Illinois sites, such as Cahokia Mounds. I believe Eero Saarinen would opt for the Eco Arch which, with surrounding development, would generate billions of dollars to a dying city over a bird sanctuary which would generate tons of avian fertilizer? How could the National Park Service and Michael Van Valkenburgh have announced a plan that would honor Eero's legacy on the East St. Louis riverfront with such an impoverished idea? Why was not one colleague of the Arch designer invited to collaborate? The answer to all these questions should alert concerned taxpayers to the errant path of this wasteful project. The core of this proposal is an extension of the Gateway Arch green space in the form of a vast landscaped amphitheater lawn as large as twenty football fields, situated on that monument's, within a hundred acre National Park. It will be shaped in its catenary curved parabolic form. The Eco Arch doubles the width and height of its mirrored image to the west. The view from the amphitheater will focus on the impressive St. Louis skyline and on the Arch. It will be enlivened by a computerized fountain, that fills the arch form with a constantly changing, opening and closing curtain of water. From St. Louis the view of the lush green park, raising from the river will provide a quietly beautiful and appropriate vista, set against a strong and geometrically related new skyline of its own. The Eco Arch will replace dilapidated industrial wasteland with a tree-lined park surrounded by sustainable, mixed-use economic development rising on concentric terraces. It will visually neutralize the divisive elevated highway system, and will physically engage and positively integrate into the street system of East St. Louis,returning to that City, as a catalytic element of civic rebirth, its long-past Riverfront. Saarinen's colleagues are in agreement. Eco Arch is a development proposal for the East St. Louis Riverfront that extends the Jefferson National Memorial across the Mississippi River into Illinois in a way that harmoniously completes Eero Saarinen's grand vision. The Gateway Arch design symbolizes the mid-twentieth philosophy dominant over nature. Eco Arch, with its similar parabolic form wedded to the earth, eloquently expresses the ecological, environmental and cultural concerns of the twenty-first century. In 1981, Saunders Schultz designed and built the first model of the basic Eco Arch concept. After presenting the project locally and nationally for several years, he invited architect Theodore J. Wofford and program development expert, the late Roger Fritz, to join him in this creative collaboration. Schultz has presented the development to hundreds of civic, community, political, spiritual and cultural leaders, as well as to many other groups in Illinois, Missouri and nationally. The response has been universally positive. Both Wofford and Schultz have worked with Saarinen. The Eco Arch concept incorporates economic and ecological elements in its design. Elegant, yet practical, this development will benefit our entire region by creating jobs through its construction, its mixed-use facilities and as a tourist destination, elevating land on both sides of the river to rank with the most prime real estate in the nation. The Eco Arch extends the St. Louis riverfront across the Mississippi River, completing the grand competition, and restoring the role of the River, that has for so long divided us, to again be the heart and center of our region, a shining band uniting our communities. Charles Harris, Chairman, Harvard Graduate School of Design and Landscape Architecture. February 2nd. 2011, "I read the recent article about the various changes in the winning arch landscape plan for the west bank and almost none for the east side. A very deep mistake will be made if the competition cuts out an opportunity to consider your brilliant proposal for the East Side of the river! What is being proposed on the East Bank is empty of any historic significance."